Work has begun to restore oyster reefs in the Dornoch Firth that were fished to extinction more than 100 years ago. The reefs are built from old shells, with about 20,000 oysters now being placed on them in a grid formation. The aim is for the reefs to become self-sufficient and sustain four million oysters in a 40 hectare area. Researchers say it is the first time anyone has attempted to restore the endangered native European oyster to a protected area where it was extinct. 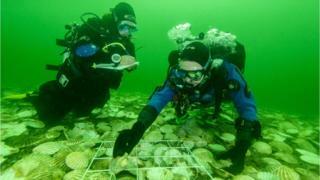 The team behind the project in the north of Scotland introduced the first 300 oysters in cages on the seabed last year to test their survival chances. Although some died, enough stayed alive to give biologists confidence to continue the project. They will now begin carefully placing a further 20,000 oysters on the first of the reefs, which are being created from 20 tonnes of waste shells from the scallop and mussel industry to mimic their natural environment. The oysters, which were all grown in the UK by producers who would normally breed them for consumption, are first cleaned and checked for disease and parasites before being regularly monitored on the reef. If all goes to plan, the number of oysters will increase to 200,000 over the next three years, and to four million over five years. This would ultimately represent the full restoration of the self-sustaining oyster reefs that existed in the Firth - which is now a Marine Protected Area - before being wiped out by overfishing in the 19th Century. Oyster reefs are amongst the most endangered marine habitats on Earth - and scientists hope this research might one day enable conservationists around the world to reintroduce the species to other areas where they have become extinct. The project is being led by Dr Bill Sanderson, from Heriot Watt University, who said: "We've laid them out on the seabed and we're going to come back and see how many of them succumb to predation and how many of them survive. "They're quite tough in many ways. They are adapted to sub-tidal living - living under water - so I think they will surprise us and will do well." The reefs are being paid for by the owners of the Glenmorangie distillery, which sits on the banks of the Dornoch Firth. Because the oysters are so efficient at filtering water as they feed, they will work alongside a newly installed anaerobic digester to ensure effluent water from the distillery is cleaned. Hamish Torrie, from the distillery, said: "It's nature and technology working in partnership to achieve a long term result. "The conditions in the Dornoch Firth are perfect for the restoration of this native species. "Oysters were in this system up to 10,000 years ago and of course they were fished out over 100 years ago. "Basically we're putting something back that was there previously."